List of Indispensable OS X Commands lists some important commands for the newbies to Apple Mac OS X 10.8 Lion. This is a small list of commands normally used. In other words, this list of Indispensable OS X Commands is not a full or complete list, there are few hundred UNIX commands you will find in reference books, but this list of Indispensable OS X Commands will definitely serve the day to day works that includes working on your server or installation of a web software locally to test. As we all know, Apple vanished few age old things in OS X 10.8. So basically a fix is needed, which we described here on Fixing UNIX Commands After OSX 10.8 Updates.There is no iTerm anymore. Terminal looks pathetic like a text editor, only Bash is supported, so to get back iTerm you have to follow this guide – Customize iTerm2 with Color Schemes, Syntax Highlighting and get ZSH shell. The importance of this article is that, you can perform complex works like installing WordPress on Mac OS X With Command Line LAMP Configuration with MAMP like software. Also check another related guide – Linux Commands and UNIX Commands for Server. pwd is a command that will show where you are. In the above screenshot you can see it is showing the location as /Users/abhishekghosh. ls is a command that lists all the files and folders of the current directory. man is for manual. For example, if someone wants to read the manual for using man command, the command man man will show the list. cd is change directory. In the above screenshot if we use cd Desktop ; we will be inside Desktop folder. Double dot, that is .. moves you one directory level up. This usage was shown on how to get inside the root of OS X Guide. cal shows calender. It is practically for fun. brew is for installing software and is equivalent to yum in RHEL, CentOS or apt-get in Debian, Ubuntu. So the complete command will be brew install package-name. which with package-name shows where the software is installed. For example, which php will show where it is installed, if it is installed. We use it to understand whether the package is installed or not. !! runs the previous command again. The usage of ssh is shown separately in another guide. Basically other all major commands are same in any UNIX or Unix like OS / Linux. This Article Has Been Shared 346 Times! 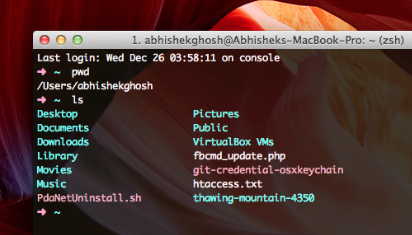 Cite this article as: Abhishek Ghosh, "List of Indispensable OS X Commands," in The Customize Windows, December 26, 2012, April 25, 2019, https://thecustomizewindows.com/2012/12/list-of-indispensable-os-x-commands/.